Got trouble with the top load dryer in Markham, Ontario? Need washer & dryer servicing? In our local company, we fix top and front load dryers but also combo appliances. You can turn to us whether you need repair service urgently or new installations. The pros on our team are all insured, qualified, and trained to provide excellent service. Our Markham dryer technician will rush to help you out should an emergency occurs. Always count on us for prompt and quality services. Whether you own a front load washer and dryer combo unit or an independent dryer, you want the appliance to operate well and safely. With our services, you can be sure of its good performance. We take any precaution and step necessary to ensure there will be no safety hazards when you are using your appliance. You can count on us to do excellent dryer installation since the connection of the appliance is important to your safety. No matter which appliance you buy, trust our pros to install it. 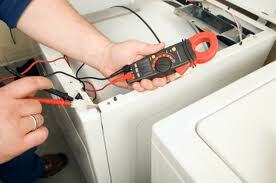 You can always turn to our Appliance Repair in Markham for dryer maintenance service. Even if you don’t use the appliance daily, lint is still accumulated in the dryer’s tubes and vents and can block proper air circulation. When air is blocked and thus entrapped inside the appliance, the dryer won’t perform well and might get overheated. With regular dryer service, you avoid such problems and prevent issues caused by worn parts. However, our company is always available to offer dryer repair in Markham. We come to your house to fix the dryer as quickly as possible. Our pro will carry the necessary parts in case some dryer parts are damaged and must be replaced. Being prepared to service dryers and solve problems is one thing you can trust when you work with us. The dryer technician from our company will be ready to address any problem. We always utilize high tech equipment for the diagnosis of problems but also the long years of our experience. With us, dryer problems are fixed in one visit and free of hassle. Call us to maintain, repair, or install the dryer. The job is always done with accuracy and your safety & convenience in mind. Give us a call now and our local dryer technician in Markham will take care of your concerns.